When it comes to designing your restaurant or giving it a bit of a facelift, you need to consider the journey your diners will be going on. They come in looking to escape from their normal home setting, so it’s about providing them with the full dining experience. That means putting a focus on your interior design, as well as the food and service. Restaurant furniture plays a big part in creating an environment that will captivate your diners and keep them coming back for more. 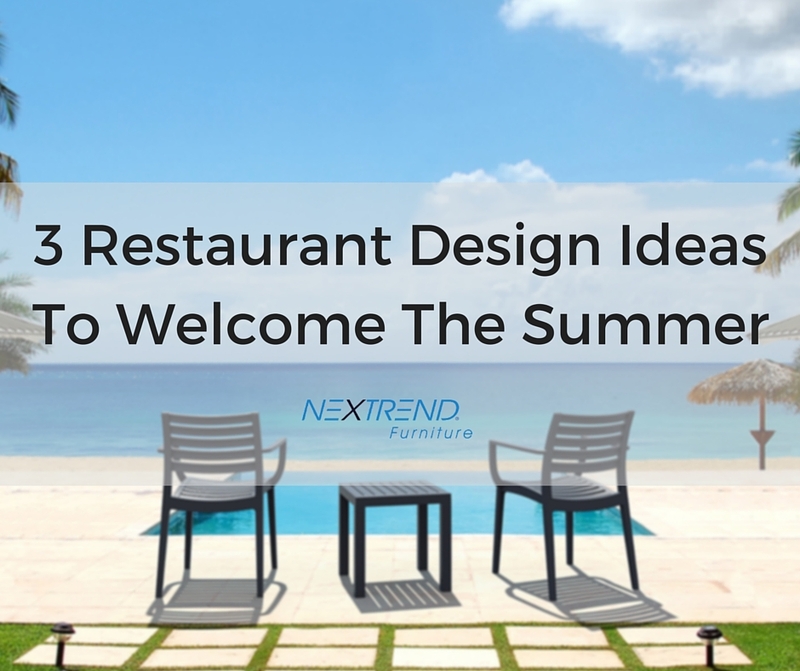 We take inspiration from the latest hospitality interior design trends to give you 3 restaurant design ideas to help you welcome the summer. From casual dining, to futuristic vibes and classic sophistication, there is a design idea to suit any restaurant style. Give your customers a modern and fresh dining experience with a little help from the latest design trends. As interior designers look to take a step away from the rustic vibe to something a little more futuristic, it’s time to think about using more innovative materials. Design is set to take on a more innovative style for the summer, with a big emphasis on materials and textures incorporated into your interiors. Impress your customers with bold designs that capture their imagination and gives them a glimpse of what the future holds. Opt for futuristic colours and inventive designs when choosing your restaurant chairs for an easy way to upgrade your restaurant design. Nextrend’s Air Chair, a chair that is a one-piece injection moulded polypropylene, offers a very modern vibe and comes in an array of captivating colours. It’s the perfect choice for giving your restaurant a more futuristic vibe for the bright summer season. Get away from the clutter and look to create a more classic environment that is all about simple sophistication. Opt for a warm colour palette and naturally rich, earthy tones to create an authentic ambience with a sense of understated luxury. The aim is to achieve a look that is classic, yet comfortable and inviting. Wooden restaurant tables and chairs can be used to add a natural, yet classic element to your interior styling. Having good indoor furniture provides those who prefer to escape the summer heat by dining inside your restaurant. Nextrend’s Florence Chair Range offers an elegant design, featuring a solid timber frame that perfectly captures this simple and authentic vibe. Remember, simple doesn’t have to mean boring, so don’t be afraid to incorporate intricate design elements along with your more simple styling. Customers are still enjoying the casual dining trend, staying on the lookout for restaurants serving good, moderately priced food in a relaxed setting. Interior design plays a key role in creating the right ambience that will leave customers happy and relaxed. With this trend comes a variety of seating options, with different restaurant chairs and table combinations giving each area in your establishment a unique feel. Diners will soon develop a favourite space, with different arrangements suiting different preferences. This trend allows restaurant owners to maximise the space they have, without needing to worry about everything matching up. Bring in restaurant furniture that gives customers lots of different seating options for any time of day. It’s all about creating an environment that leaves your diners feeling comfortable and cosy in an informal setting. Thinking about giving your restaurant a new look in time for the summer? Visit Nextrend’s restaurant furniture range to help achieve your latest design ambitions.